It’s summer, which means a bounty of fruit everywhere. I’ve developed a taste for fruit later in life, but at this point I’m a veritable berry fiend, and I’m warming up quite a bit to cantaloupe, honeydew melons, and mangos, too. Step by step — it’s always exciting when taste buds evolve! The nice thing about fruit is that it’s an easy, satisfying snack or dessert at any time of day. The downside is that, if you’re not careful, fruit can shift from ripe to overripe under your nose. Berries, even when you store them well, can quickly become mushy; mangos and bananas develop spots overnight. 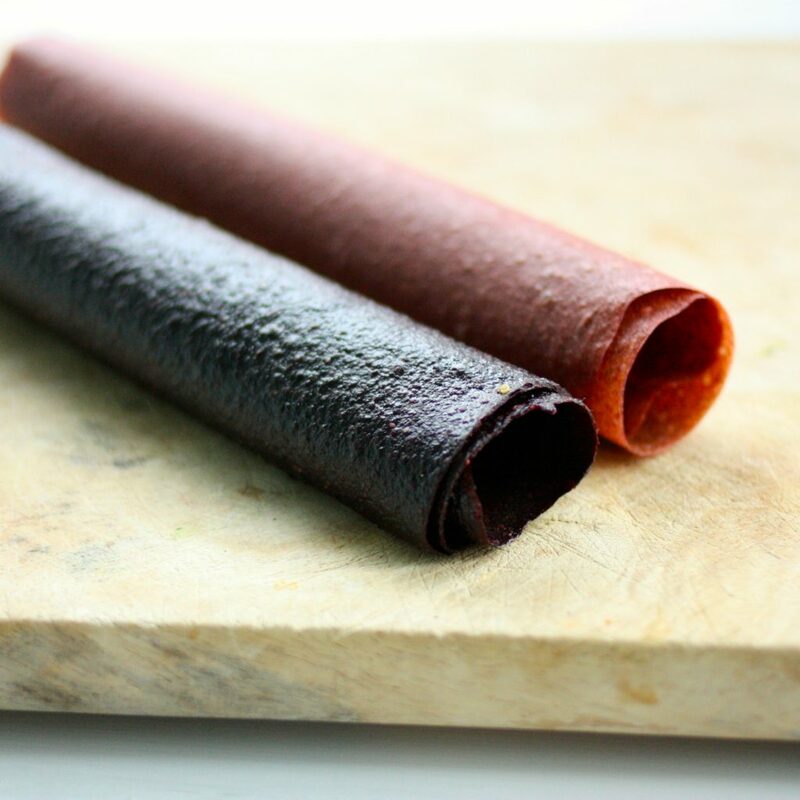 Sometimes, if fruit is just overripe but still quite edible, I’ll just blend it up into a smoothie, but as of today, I have a new solution: homemade, raw vegan fruit leathers. That it’s taken me this long to make them is kind of ridiculous, but now I have, and there’s no turning back. 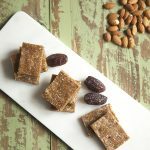 It’s amazing how easy it is to make fruit leathers at home: simply blend up any of your favorite fruits with a tablespoon of ground chia or flax, and you’re on your way. The only thing to watch out for is consistency. Using a very watery fruit, like melon, can get tricky, so try to blend it with something denser, like mango or banana. You can also add some dried fruits to thicken up a mixture (as in my blueberry + goji blend, below). 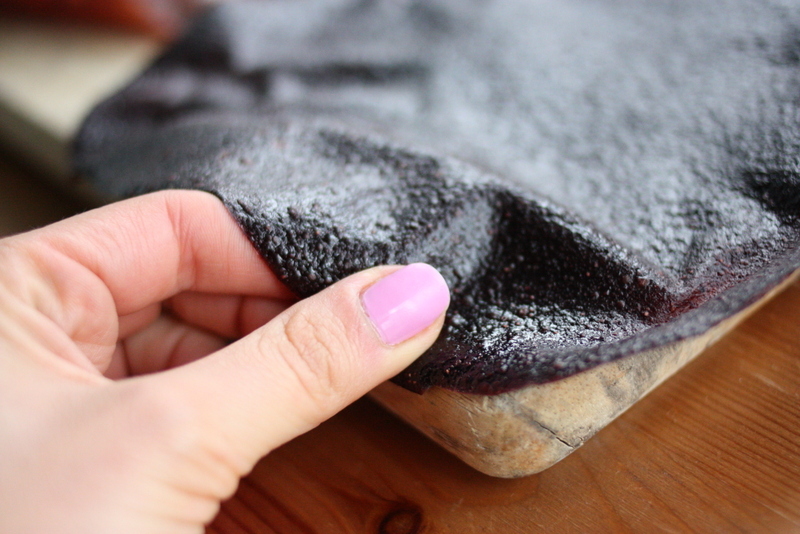 To make fruit leathers, you’ll need a dehydrator that’s rectangular or square, and can accommodate Teflex sheets. But if you have a round dehydrator (like the Ronco I used to own), you could try your hand at using parchment paper that you’ve cut into a circular shape; I used to do this all the time for crackers! 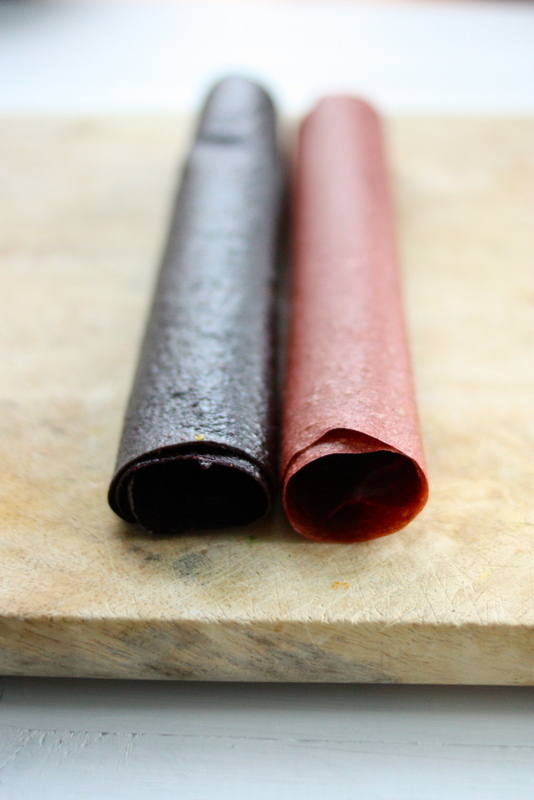 My first few forays into fruit leather making were simple: an all banana and strawberry banana blend. I decided to get a little more creative after that, and created a blueberry and goji mix that’s packed with antioxidants, and has a deep, sweet/tart flavor. I’m sure that many other varieties are in my future; I also can’t wait to experiment with adding cacao powder, cinnamon, and other flavorings. But for now, simple is best. After that, 6 or so hours in the dehydrator, and you’re set. Here are the recipes. 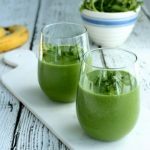 Blend all of the ingredients in a blender till smooth. 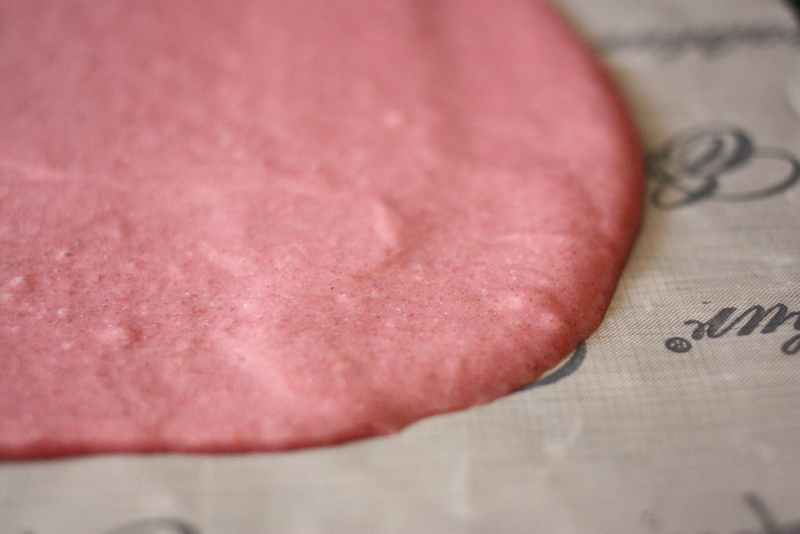 Use a regular or inverted spatula to spread the mixture onto a Teflex lined dehydrator sheet. I like to make a large, rectangular shape. You can lightly grease the Teflex with coconut oil or spray it with coconut/olive oil spray before you spread the mixture, to make it easy to remove it later on. Dehydrate for four hours at 115 degrees. Gently use your spatula to peel the leather off the Teflex, and then flip it over. Dehydrate for another two hours or so. Makes 1 very large or several small fruit leathers. 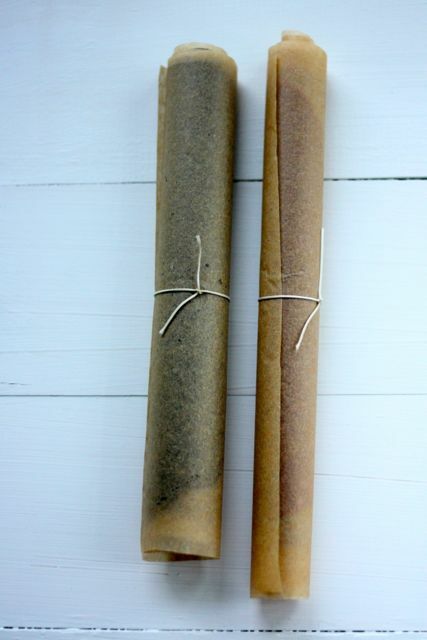 Once your fruit leathers are done, you can wrap them up using parchment or wax paper. See? Easy. 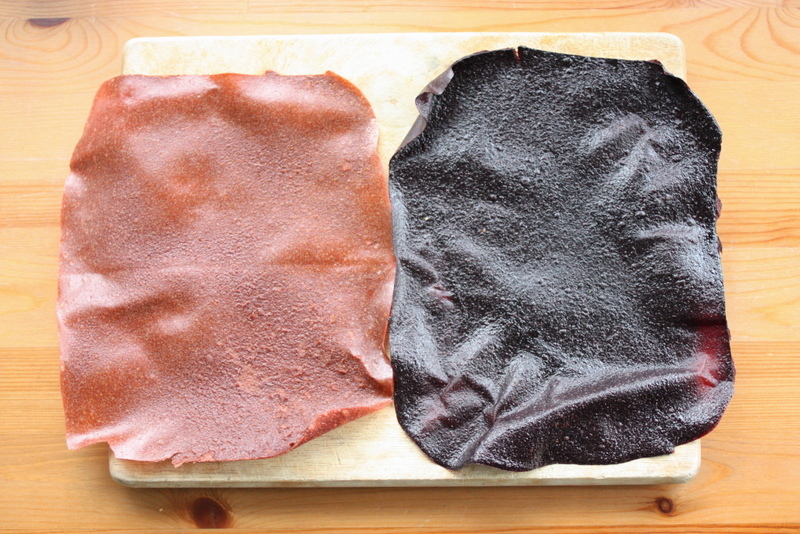 I tend to make a very large fruit leather with each recipe, then cut it into smaller pieces as needed, but you could also try spreading your mixture into smaller circles before you dehydrate. It’s really up to you. Look at the beautiful blueberry goji color — you’d think I’d used blackberries! Any questions? Let me know. I hope you enjoy making these at home. Tomorrow, another use for delicious summer berries…so stay tuned! I am super excited to see this. 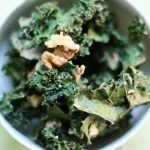 Will make it once the dehydrator is free — I’m making your raw beet granola first! Such a great idea! No dehydrator yet, but I’ll be trying these in the oven! If they turn out well for you, please let me know! I’d love to be able to add an oven option. P.S. Should the 1 cup chia seeds in the blueberry/ goji version say 1 tablespoon? Oh, good gracious, yes! I just fixed it. Thanks, Hailey 🙂 Hope school’s going well! Please let me know if these work in the oven! I would love to try it! Oh my gosh! 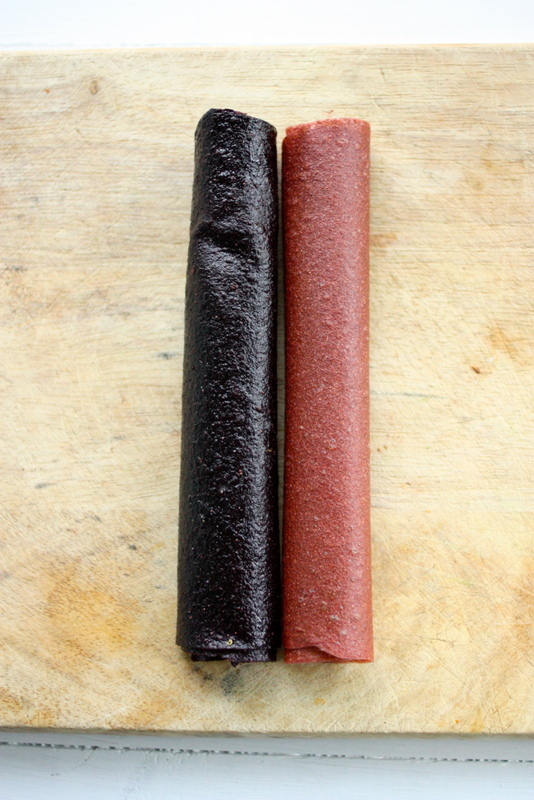 I used to eat fruit leather all the time when I was little, I was crazy about it. Albeit, it was probably more like sugar leather. This looks like such a fun recipe, I love it. This looks like the perfect addition to a lunchbox or a delicious after-school snack. 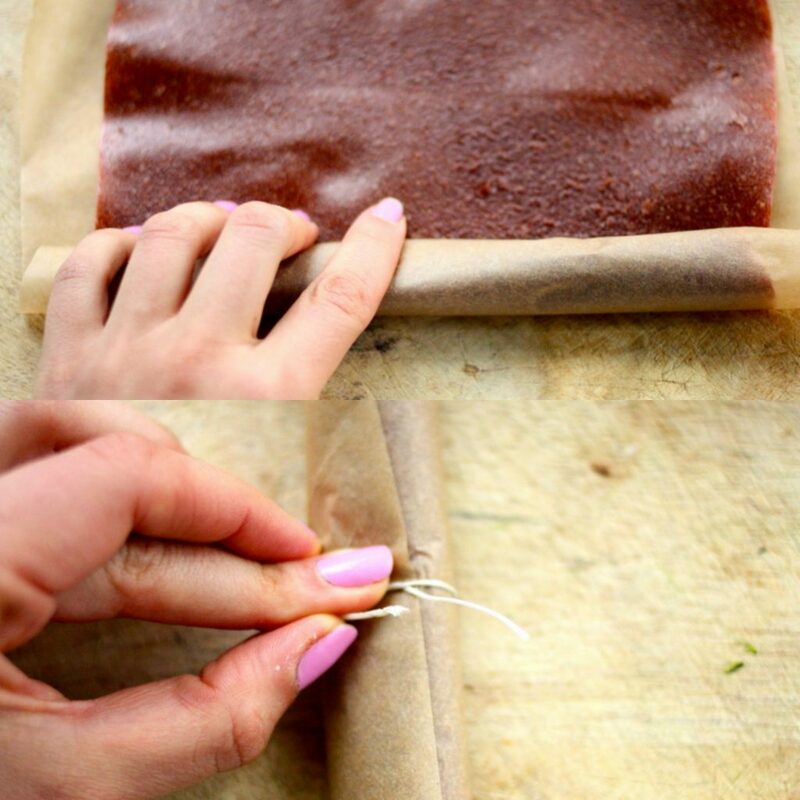 I never knew making fruit leather was so simple! Oh YAY! Thank you I’ve seen so many recipes but there are a lot of crummy “pinterest” posts out there and none have ever seemed like trustworthy sources (I’d hate to waste all that fruit!). Lol. Can’t wait to make these tomorrow. Also, just if it’s helpful for anyone, I lucked out and got my Excalibur 5 tray dehydrator on Craigslist…for about a third of the retail price. if you’re in the market but also on the budget, check out Craigslist if you haven’t yet…you might find a bargain! Craigslist or EBay! You can find them in either place. Does this work for apple? I have a ton of apples on my trees right now, and am trying to find solutions for them. Apple would be awesome. Maybe with some cinnamon, too! Gorgeous! I remember Fruit-by-the-foot from my childhood. So good, but so bad. This is a step up for sure! I love fruit leather! Mom used to make it when I was a kid, but I haven’t had it in years! Now I must. 🙂 Thanks! I want to give this a try! I just bought a house and there are SO many fruit trees/berry bushes in the back yard and I have no idea what to do with it all. This sounds like a great answer. 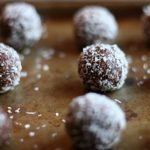 Why do you add chia/flax seed? To enhance nutrition, to thicken teh batter or for other reason? It’s for texture/pliability. Of course, there’s a little nutrition boost too. love fruit leathers! thanks for the reminder to make some before summers bounty ends. Your fruit leathers turn out so much more elegantly than mine…I guess it’s just a matter of I have to practice more, lol. This is nothing like the fruit rollups of my youth (thank goodness). You have created Designer Fruit Pleather (because pleather is even better than leather). I have messed it up a few times so this will help. Love the goji berry. Looks awesome. Thanks for some great tips! I’ve been looking for a recipe like this! Awesome this will be a great snack for the airport next week! 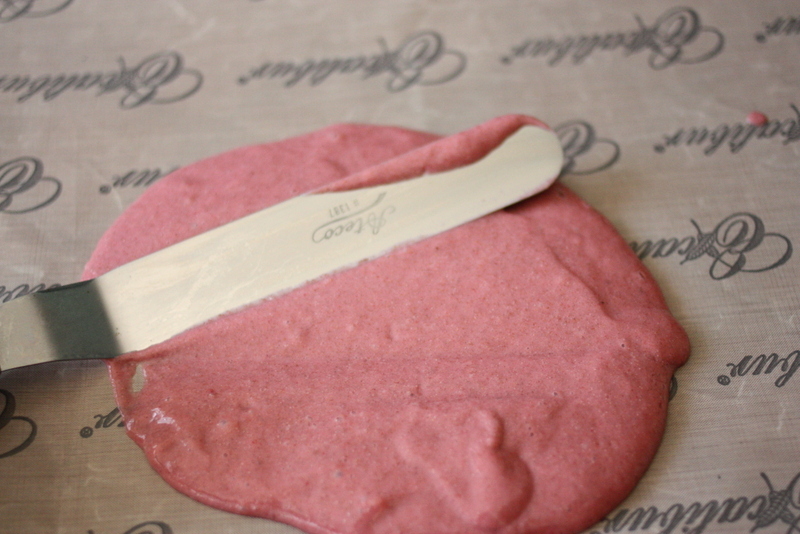 I made a mixed fruit version of these fruit leathers but I think they turned out too thin how do I thicken them but still have them turn out properly? in this dilemma. Backpacks come in a variety of designs, forms, shapes and colors. how do you recommend i use mandarin oranges (halos) i have a ton of them and was wanting to use them for leather. i also have some red and green apples and a bag of frozen mixed berries….. I have made these in the oven. they may take a bit longer but if you have a convection setting that helps. I line a cookie sheet with parchment paper and pour my mixture on it. Same thickness. turn the oven on as low as it goes. Mine will go down to about 170 which is good. I put mine in the oven before I go to bed and usually when I get up they are done. Easy peasy! I’m not ѕurе why but this website is loading еxtremely slow for me. Is anyone else having this issue oг is it a problem on my end? I’ll check back later on and see if tɦe prօblem still exists. myy know-how herde with mates. Thanks for the tip to flip halfway! Can you or have you used frozen fruit -does it change anything? I have frozen strawberries, blueberries and banana and thought about just thawing and adding all to vitamix. These look awesome! 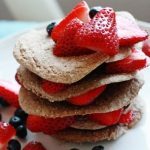 Can I use frozen berries or does the fruit need to be fresh? Thanks Karen! I think frozen will work, but you may want to let the thaw before making.